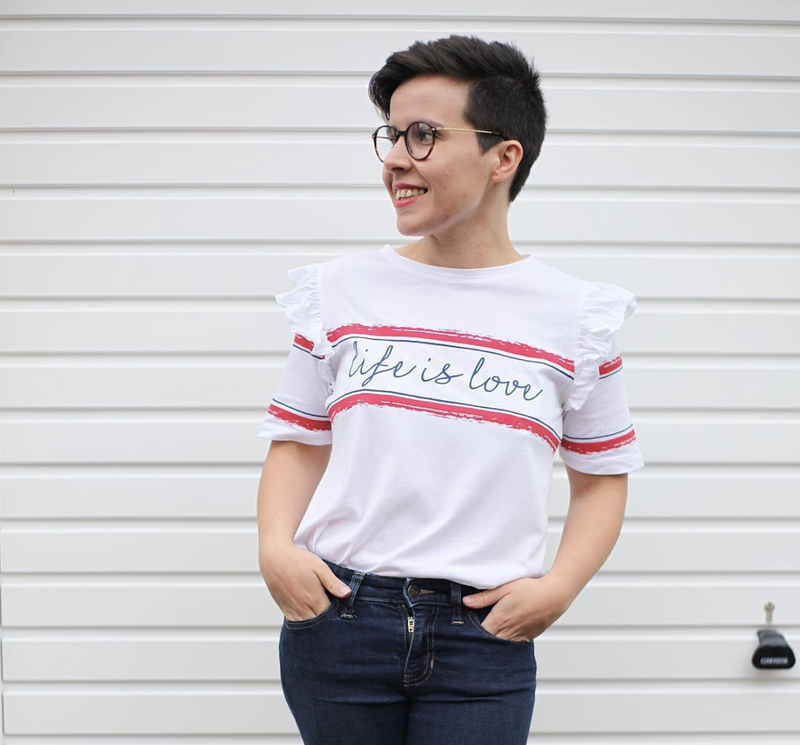 I had so much fun hosting a beauty giveaway two months ago I thought I would start the year off with another one for all you lovely Side Street Style readers out there. 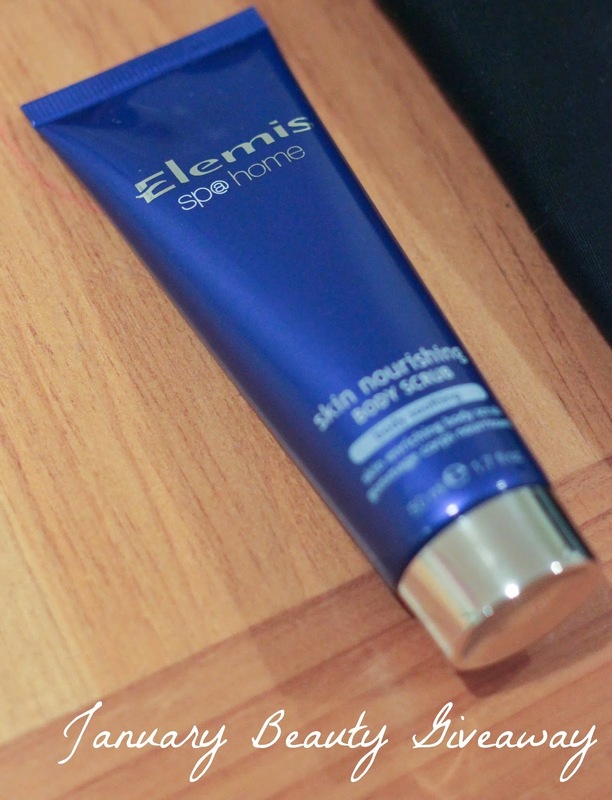 It's open worldwide and one reader is really in for a treat, with some amazing products - my two favourite being the Elemis Spa@Home Skin Nourishing Body Scrub which is so luxurious and leaves your skin feeling beautiful smooth, as well as the Liz Earle strengthening nail colour which goes on really easy, lasts up to 12 days and has no animal extracts and is approved by BUVA. 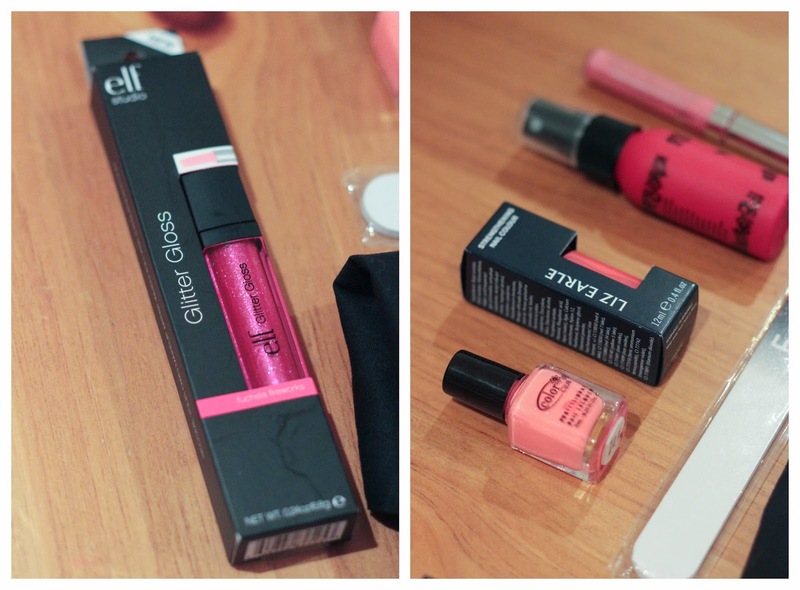 Plus other lovely little pieces including an E.L.F tote bag and E.L.F Glitter Gloss lip-gloss, a little black address book from Boux Avenue, Colour Club professional Nail Lacquer, Beauty Protector protect, Oriflame power shine lipgloss and detangle spray and an Escentual emery board. It's super easy to enter and runs until the 18th Jan. As I said before it's open worldwide, so good luck. I don't know if this is really a beauty tip but someone told me if you have a pock mark or crater scar on your face you can apply new skin(product used to cover sores)before applying makeup and it will cover over and fill in so the scar is no longer visible! Always moisturize to look younger!!!! Less chocolate and more water, will always be good for your skin!! Don't ever squeeze a pimple! It will go away more quickly (and peacefully) if you just leave it alone! I just try to keep hydrated and cleanse my skin every night. Always cream your hands and elbows as these highlight your age, when neglected, more than your face. Always cream your hands and elbows, as when neglected, they highlight your age. if you apply concealer with your little finger you won't overdo it. always take off your make up before bed! vaseline is the most useful thing in my makeup bag! For me its to use moisturiser every day as my skin is so dry. I use aveeno on my face as it sinks in really nicely and doesn't leave me shiny! drink lots of water for nice skin! Moisturize! Moisturize! Moisturize! Oil cleansing too! throw out all the old and unused stuff. Remove your make up every night and drink lots of water. Always keep an eye on how old your make up is. Wash your skin everyday, drink lots of water, and wear lipstick to look polished. It's a New Year so if your stuck in a rut when it comes to your makeup, look for new ideas and experiment with new looks. Never go to bed with any makeup on & always use SPF! Drink more water to hydrate your skin from the inside! Wash your makeup off before bed, and use a good cold weather lotion on your skin. These all look great! Everyone said everything in my arsenal! Ahh! But E.L.F. is my favorite brand of makeup, no doubt. I want to collect it all! I use baking soda as a gentle microdermabrasion on my skin. :) It is wonderful. Thank you for this chance. Give Hair Lift,Before you start blow drying your hair, add a volumizing spray to your roots. This will give your locks some added lift. Always remove your Make Up and drink plenty of water!! Use coconut oil as a hair mask ! You will see dramatic results! Drink lots of water to help with detox. Always remove make-up at bedtime and apply sunscreen every day! Never ever go to bed with your make up on! use a facial brush cleaning system! best thing ever!! new year, start afresh! be sure to wash your brushes and always remember lipbalm!! the nasty winter weather is harsh on them! Use argan oil for my hair for regenerate hair cells! If you have fine hair like me, don't under any circumstances wash it every day, it will only look more lank and be more unmanageable, instead use dry shampoo between washes. Why did I not learn that until I was 40, hopefully my tip will help others much sooner! Try & sleep at least 7 hours...my skin glows after a good nights sleep. Sudocrem is your best friend!! Always carry a compact mirror with you to check for lipstick on teeth, wonky false lashes or smudged eyeliner when you're on a night out!! A New Years beauty tip that I'm doing for 2014 is to shop my stash and use products up. I went through my hoarding collection and placed partially finished items in a basket I want to completely finish up such as lotions, foundations, powders, highlighter, blushes, primers, and concealers. Well, I love orange facial,i guess you'll love that too. Drink lots of water. I have massively increased what I drink and I feel loads better. I'm trying to use more all-natural products. If your lips have become black, then apply some tootpaste over your lips. Wash it after 10 minutes. This will prevent the blackening of your lips & will also give you the natural lip color. Milk of magnesia applied to skin before foundation helps combat shine! To finally understand which colours suit me! Vaseline on your eyelashes overnight, it keeps them healthy. Clean and disinfect your brushes regularly! Doing that ensures colour applications will not look muddy, keeps them in good shape and will clear out all the accumulated make up, dust and oils. Ditch the black eyeliner and use bronze or teal instead. Use moisturizers, cleansers etc, that are suitable for your skin type. I am going to start testing more than I did. If you wear glasses, remember to clean them daily because bacteria can build up and cause breakouts! Definitely use moisturiser on your face and hands to protect from this freezing weather. Always make sure you use products with some sun protection to prevent skin aging. And don't forget the neck! drink plenty of water to stop getting dehydrated! Moisturize with lotion that contains an spf always! always look after ur feet! clean out your makeup cases often! Put on sunscreen daily, it prevents sunspots and wrinkles. This isn't so much a beauty tip than a logical thing. Drink a lot of water. a good night's sleep and a lot of water! Drink water and stay moisturized! Don't spend too much of your life sunbathing. Drink plenty of water so your skin stays hydrated. Don't over do the makeup! regulary clean your makeup brushes. Always moisturize and protect your skin. Goku kola on your skin, it's magical!! New year; new you - take off make-up before bed, no matter what! Drink plenty of water and use loads of lip balm. Try a purifying facial mask. They're great! Try a purifying face mask. They're a great way to refresh! Freeze some camomile water and refresh with the resulted ice cubes! Drink lots of water to keep your skin hydrated! Clean your make up brushes to awoid spots and infections. Don't forget to use sunscreen! I always wash my face before going to bed and when I wake up on the morning! You feel , clean ,fresh and nice! I keep my eye cream in the fridge. Refreshing! Store eye cream in the fridge. Refreshing! Protect your skin from the cold weather, keep it well moisturised. Drink plenty of water. I started seeing a difference in the way my skin looks and feels. SOOOOOOOOO EXCITING THIS GIVEAWAY!!!!! Eeeeeeekkkk!!! If i wear makeup...i always always wash it off at night,then splash my face with freezing cold water,to close my pores back up. Also limit alcohol intake as alcohol can bring you out in spots. Dont know what happened to my last blogcomment,not sure if i submitted it or not...Think i was to giddy about this FAB-GIVEAWAY!!! My beauty tip would be to always always,try to wash your make-up off at the end of the day,when you get home from work,after a night out ect,i know i can hold my hands up, as being one of the ones that sometimes cant be bothered to take it off,as its the last thing you want to be doing when your tired. But it really does help your pores to wash it off,as i always do now,and i can see a massive difference. After i wash my make-up off i splash my face with freezing cold water this helps to close your pores,stops dirt getting in. My mum taught me one of her beauty rituals as a teenager, which was to put water in a bowl, with ice cubes and slices of lime,its so refreshing and the smell of the citrus really wakens you up in the morning,its brilliant,i try to do this 3times a week when i can be bothered,but my mum looks brilliant and she is 61yrs old.And i never break out in spots and blemishes since. Always, ALWAYS take off makeup before bed!! When using concealer, use a very light one first, blend and then add one that matches your skin color. Really works great at hiding dark circles. I use witch hazel to clean my face, it also helps tighten my pores. My tip is to exfoliate at least weekly to reveal softer, smoother more radiant skin. I use an at home glycolic acid peel weekly. For the New year, check all your make up to make sure none of it is expired! I make sure I wash all my makeup off before bed and moisturise in morning half hour before applying my makeup. Use more lip balm in winter. start your day with a worm glass of water. Don't wear mascara and/or curl your lashes on days that you don't need to, such as weekends. It gives the eyelashes a rest.